Yep. Cat’s out of the bag. She’s probably too polite to say it to your face. This entry was posted in A Hell's Belle's Guide to the South, Blogging challenge and tagged A-Z Blogging Challenge, idioms, Southern sayings, the New South. Bookmark the permalink. I had a friend who always said, “Bless your little kitten ears!” Loved that! Ahahaha, it’s so true. 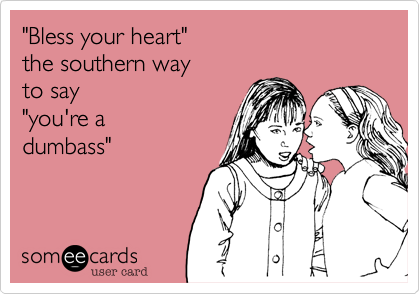 We southerners can say the worst things in the sweetest way. Yup, another one is “That’s nice”! So double voodoo-doo! Say it sweetly, so it don’t stank!!! Thanks for visiting for my Letter B…slalom ski gal…Bless Your Heart…LOL!!! And thank you, for stopping by, Miz Texas! 99 % of the time that is true. Once in a blue moon I mean it as commiseration. But it is spoken with a different tone and infection then. It is a pale shadow of the continuing chronicles of Edward, but thank you! I just about peed myself laughing when I saw him at the Indian festival.